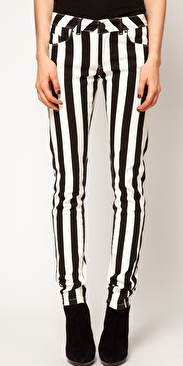 Since bold stripes are super chic right now, try a pair of fun striped jeans to stand out from the crowd! Very rock and roll, don't you think? This Balmain pair is super fabulous with its zipper details and kinda wrap button closure! Alas, they will cost you $2,038 at Net-A-Porter. Luckily for you, there are plenty of affordable options out there as well! I think this pair by ASOS, for a super reasonable $62!